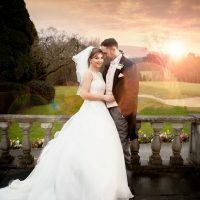 Kingswood Golf and Country Club offers a tranquil and versatile setting for weddings receptions, civil ceremonies and partnerships. This hidden gem is set in the heart of the Surrey, close to the Surrey Hills and area of outstanding natural beauty. Conveniently situated close to excellent road and rail links, Kingswood is within easy reach of London, the M25 and M23. The Dining room is naturally lit via the panoramic windows and enjoys delightful views over the grounds. The neutral décor provides a blank canvas for your style and decorations and the setting also benefits from a private bar and terrace. 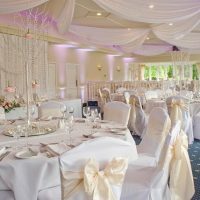 For larger celebrations, the dining room sits adjacent to the ballroom and conservatory offering extra space and versatility. 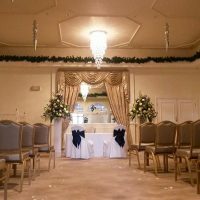 Opulently furnished with champagne drapes and crystal teardrop chandeliers, the ballroom provides a romantic setting for ceremonies and evening receptions. The Warren Room features traditional wood beams and pillars which lend themselves to the relaxing atmosphere. This newly renovated setting has a modern bar and access to an exclusive walled garden. The neutral tones are an ideal backdrop to express your personality and style in this elegantly rustic space. Perfect for smaller more intimate gatherings, the Braid room accommodates up to 30 guests. The cosy atmosphere is enhanced with the open brickwork and feature fireplace. 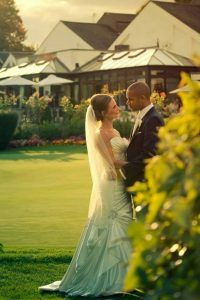 Situated on the first floor of the clubhouse it is conveniently near to the Warren and Dining rooms. Bathed in light from the wraparound windows, the Conservatory offers a harmonious and airy ambiance. Step through the double doors onto the reserved terrace to enjoy the glorious views of the Surrey countryside. Being adjoined by the dining room provides the option for intimate meals with space for grander receptions. 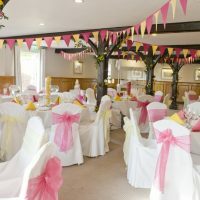 Take advantage of the boutique hotel rooms to enjoy a relaxing evening following the excitement of your special day. Beautifully appointed, they include the very best of modern facilities including sky TV, air conditioning, complimentary Wi-Fi and Nespresso coffee machines,.